The Exelon Byron Nuclear Generating Stations in Byron, Illinois. Nuclear power was the energy of Tomorrowland  in the 1950s it was going to make electricity too cheap to meter  until it came to a standstill over the past couple decades. It's now poised to make a dramatic comeback. At least, that's what many politicians and the media say. As the Senate this week debated the Warner-Lieberman carbon cap-and-trade bill, which would put a federal limit on greenhouse gas emissions, many doubtful senators said they wouldn't vote for the measure unless massive subsidies for nuclear were included. (The bill was shelved.) Even some veteran greens who were once dead set against atomic power, like Greenpeace co-founder Patrick Moore, now see nukes as the only way to save civilization from climate change. And last month Wired magazine urged environmentalists to "Go Nuclear," claiming, "there's no question that nuclear power is the most climate-friendly industrial-scale energy source." That's debatable, to say the least. There's no question that a nuclear plant, once it's up and running, produces comparatively little carbon dioxide  a British government report last year found that a nuclear plant emits just 2% to 6% of the CO2 per kilowatt-hour as natural gas, the cleanest fossil fuel  but nuclear energy still seems like the power of yesterday. After a burst of construction between the 1950s and late 1970s, a new nuclear power plant hasn't come on line in the U.S. since 1996, and some nations like Germany are looking to phase out existing atomic plants. That reverse is chiefly due to safety concerns  the lingering Chernobyl fears of nuclear meltdown, or the fact that we still have yet to devise a long-term method for the disposal of atomic waste. But to Amory Lovins  a veteran energy expert and chairman of the Rocky Mountain Institute  there's a much better green reason to be against nuclear power: economics. Lovins, an environmentalist who is unusually comfortable with numbers, argues in a report released last week that a massive new push for nuclear power doesn't make dollars or cents. In his study, titled "The Nuclear Illusion," he points out that while the red-hot renewable industry  including wind and solar  last year attracted $71 billion in private investment, the nuclear industry attracted nothing. "Wall Street has spoken  nuclear power isn't worth it," he says. More nuclear subsidies, which many on Capitol Hill are pushing for, won't do the trick either. Lovins notes that the U.S. nuclear industry has received $100 billion in government subsidies over the past half-century, and that federal subsidies now worth up to $13 billion a plant  roughly how much it now costs to build one  still haven't encouraged private industry to back the atomic revival. At the same time, the price of building a plant  all that concrete and steel  has risen dramatically in recent years, while the nuclear workforce has aged and shrunk. Nuclear supporters like Moore who argue that atomic plants are much cheaper than renewables tend to forget the sky-high capital costs, not to mention the huge liability risk of an accident  the insurance industry won't cover a nuclear plant, so it's up to government to do so. Conservatives like Republican presidential candidate John McCain tend to promote nuclear power because they don't think carbon-free alternatives like wind or solar could be scaled up sufficiently to meet rising power demand, but McCain's idea of a crash construction program to build hundreds of new nuclear plants in near future seems just as unrealistic. If not nuclear, then which carbon-free energy source will power our postclimate change future? Lovins favors a diverse mix of renewables, integrated to compensate for individual faults  solar for when the wind doesn't blow, and vice versa. He also wants to focus on energy efficiency and micropower, shifting away from the old model of the massive central plant sending out electricity  i.e., your local nuke  in favor of smaller plants, even residence-scale ones, built close to population centers. 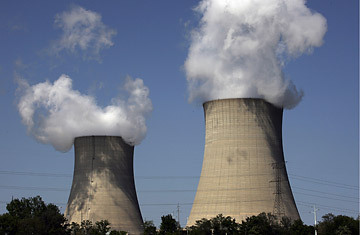 Reducing carbon emissions, he argues, will be cheaper and safer if we turn away from nuclear in favor of alternatives. "The bottom line is that nuclear buys two to 10 times less climate protection than its competitors," says Lovins. Certainly Lovins is right to argue that the nuclear industry can't compete on the free market on its own terms  or even without the billions in subsidies it already receives. But renewables also receive their share of government largesse  the booming global solar industry wouldn't be anywhere near as hot without a generous German tariff. New research and development might cut atomic costs, just as we hope will happen for alternatives. And the sheer size of the problem facing the global energy industry demands that no solution can be dismissed out of hand. On June 6 the International Energy Agency released a study calling for $45 trillion in energy investments between now and 2050, including both a vast expansion in wind power and the construction of some 1,400 new nuclear plants. The conservatives are wrong to argue that nuclear deserves special treatment  it should live and die on the private market like any other technology  but we may not be done with the atom yet.